LULAC GLANCES SUPREME COUNCIL.....continued....... Council. LULAC to recommend only LULAC members for government positions in Washington D.C. Ed Pena is to be the National Chairman of this committee. John Terronez to head the Midwest Committee. Ed Pena is State Director of Washington D.C. Hillary Sandoval, LULAC member from El Paso, has been appointed by President Nixon to head the S.B.A. , Small Business Administration, in Washington, D.C. Judge Alfred Hernandez, who is also National Consultant on LULAC HOUSING gave a report on the various LULAC HOUSING PROJECTS. Report on LULAC NATIONAL CONVENTION TO BE HELD ON JUNE 26, 27, 28, 29, 1969 in Long Beach, California. Ed Chavez, Convention Chairman, promises a fun and work convention. Registration will be $25.00. Dr. George Garza gave a report on the proposed Constitutional Revisions. 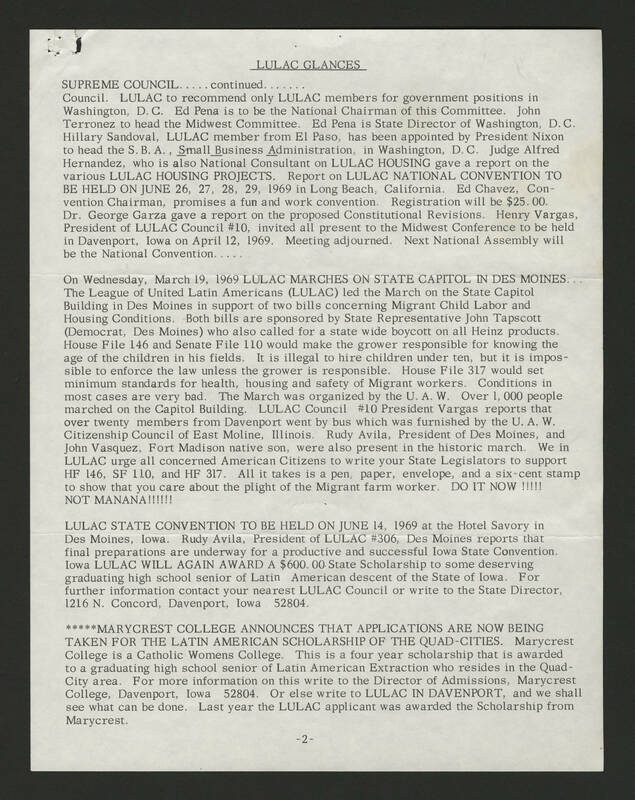 Henry Vargas, President of LULAC Council #10, invited all present to the Midwest Conference to be held in Davenport, Iowa on April 12, 1969. Meeting adjourned. Next National Assembly will be the National Convention...... On Wednesday, March 19, 1969 LULAC MARCHES ON STATE CAPITOL IN DES MONIES... The League of United Latin Americans (LULCA) led the March on the State Capitol Building in Des Moines in support of two bills concerning Migrant Child Labor and Housing Conditions. Both bills are sponsored by State Representative John Tapscott (Democrat, Des Moines) who also called for a state wide boycott on all Heinz products House File 146 and Senate File 110 would make the grower responsible for knowing the age of the children in his fields. It is illegal to hire children under 10, but it is impossible to enforce the law unless the grower are responsible. House File 317 would set minimum standards for health, housing and safety of Migrant workers. Conditions in most cases are very bad. The March was organised by the U.A.W . Over 1,000 people marched on the Capitol Building. LULAC Council #10 President Vargas reports that over twenty members from Davenport went by bus which was furnished by the U.A.W. Citizenship Council of East Moline, Illinois. Rudy Avila, President of Des Monies, and John Vasquez, Fort Madison native son, were also present in the historic march. We in LULAC urge all concerned American Citizens to write your State Legislators to support HF 146, SF 110 and HF 317. All it takes is pen, paper, envelope, and a six-cent stamp to show that you care about the plight of the Migrant farm worker. DO IT NOW !!!!! NOT MANANA !!!!!! LULAC STATE CONVENTION TO BE HELD ON JUNE 14, 1969 at the Hotel Savory in Des Monies, Iowa. Rudy Avila, President of LULAC #306, Des Monies reports that final preparations are underway for a production and successful Iowa State Convention, Iowa LULAC WILL AGAIN AWARD A $600.00 State Scholarship to some deserving graduating high school senior Latin American descent of the State of Iowa. For further information contact your nearest LULAC Council or write to the State Director, 1216 N. Concord, Davenport, Iowa 52804. *****MARYCREST COLLEGE ANNOUNCES THAT APPLICATIONS ARE NOW BEING TAKEN FOR THE LATIN AMERICAN SCHOLARSHIP OF THE QUAD-CITIES. Marycrest College is a Catholic Womens College. This is a four year scholarship that is awarded to a graduating high school senior of Latin American Extraction who resides in the Quad-City area. For more information on this write to the Director of Admissions, Marycrest College, Davenport, Iowa 52804, Or else write to LULAC IN DAVENPORT, and we shall see what can be done. Last year the LULAC application was awarded the Scholarship from Marycrest.